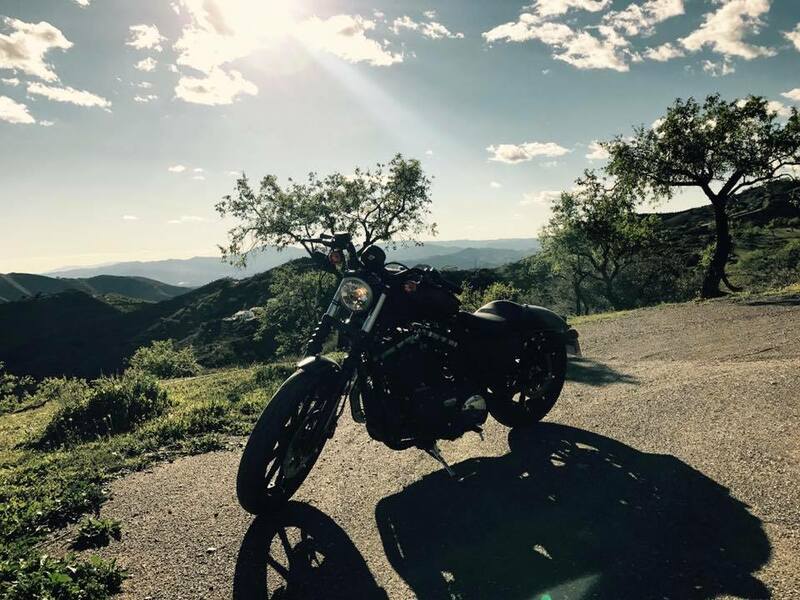 Rachel Baker, Body Piercer and Harley Lover, U.K.
Rachel Baker is a piercer from the U.K. As a new rider she found the British weather to be less than ideal for riding her Harley so she relocated to Spain for 6 months of motorcycle exploration. I’ve always been drawn to the biking community but was persuaded to get a car and not a bike by my parents as they were not a fan of motorbikes! I have always wanted to take my bike test but never had the time, money and inclination at the same time. 2 ½ years ago I met my partner. He is a keen motorcyclist and is a land speed racer. He said he would take me as a pillion but never got around to it as he needs to have his bikes adapted due to him having one arm. We also couldn’t agree on the type of motorbike to get! In 2017 I had put some money away for a “rainy day” but after a discussion with my other half, I decided to apply for my bike test instead as we couldn’t agree on what bike would suit us both; He is 6’3″ and I am 5’2″. Finding the right bike wasn’t easy. I made a spur of the moment decision and decided to use the rainy day money and booked a DAS course!! Finally, I had the time, inclination and money at the same time, so why not!! After, what I thought, was a dodgy couple of days at the beginning of the training, I started to believe that I would fail. I just couldn’t get the hang of the U-turn. Little did I know, the instructor had more confidence in my skills than I did and was making me practice on a much tighter U-turn so it would feel easy on the day! I passed both Mod 1 & 2 with only 1 advisory. I was ecstatic and couldn’t wait to go bike shopping!! I had 2 bikes in mind; A Triumph Street Twin and a Harley Iron 883. My choices are mainly due to being short and the need to feel comfortable on a bike. I test rode both the following week and found the decision very hard. As I am only 5’2″ there are very few options to test ride at any of the dealerships. Sycamore Harley Northampton did their utmost to help. I couldn’t believe it when they swapped seats and made numerous suggestions about making it low enough for me. So, with that in mind, and the fact that I looooooved the noise, comfort and colours, I chose the Harley. I got lower shocks on it to make it easier to manoeuvre and a thinner seat. Now it’s PERFECT! I work really hard in the Summer months, trading at Bike Rallies and music festivals so I rarely get to ride when the weather is good. I passed my test in October, it rained solidly from late November and the weather was awful so I didn’t get much riding experience in the UK. In fact, I only rode out 3 times on the Harley. My partner suffers from phantom limb as an amputee and after his accident really struggles with aches and pains in the cold and wet. He suggested that we spend some time in Spain (extended holiday) and we could both ride our bikes in the beautiful Spanish weather. 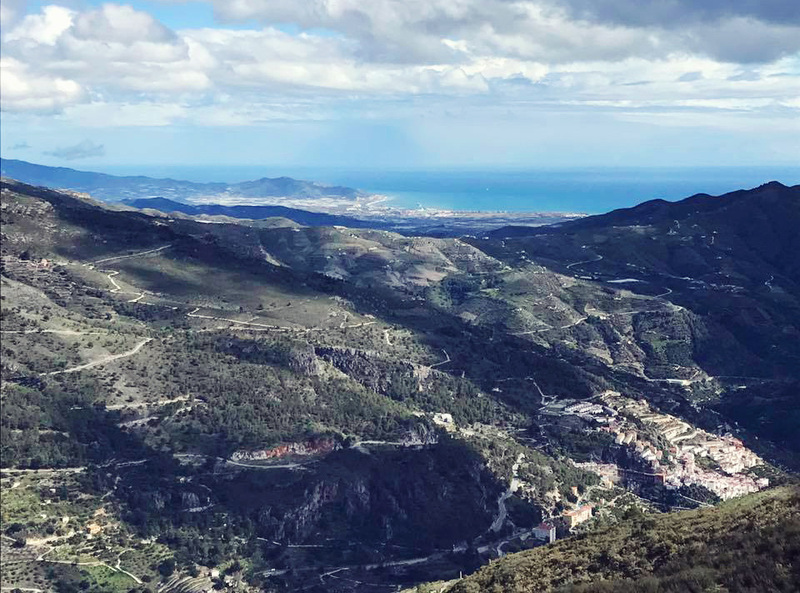 We were lead down to our villa by the estate agent and it was a 3.5 km dirt track… with sheer drops off the edge of a mountain… OMG, I HATE HEIGHTS!! We looked at each other in disbelief! How on earth were we going to ride the Harleys off this dirt track, every day?! The next day was glorious sunshine and we breathed a sigh of relief. I did some research on social media and found a local biker group called OMG (Oldies Motorcycle Group) which I requested to join. (As an honorary member of course as I’m not that old!) I knew they would know some good roads as most of them live here full time and know the best spots to visit! They were having a ride-out the following week which I invited myself and partner along to. I explained that I had not long passed my test. They informed me that they don’t zoom along, they simply admire the beautiful scenery and I was more than welcome to join them. I was so excited! 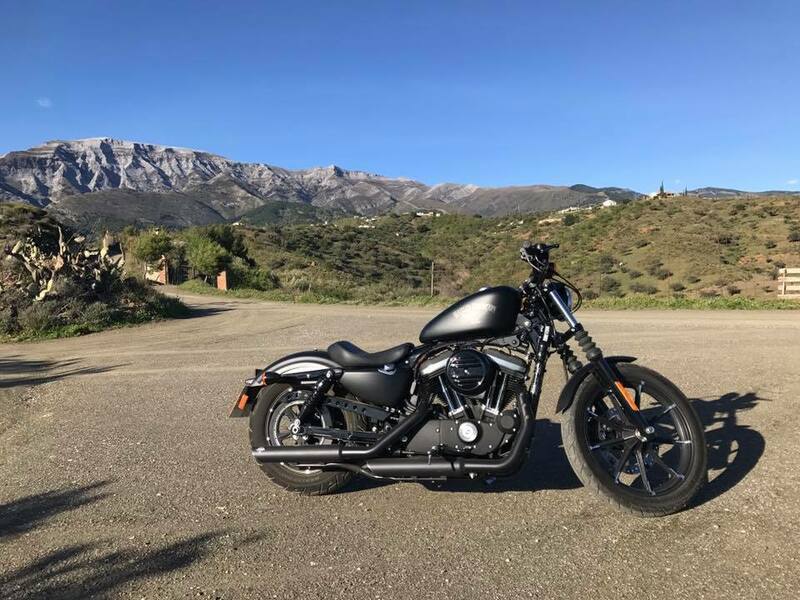 After only riding in the UK 3 times since passing my test, 5 months ago, we first went out for a test run so I could see how I felt on Spanish roads, on the right-hand side, and what a baptism it was! IT WAS AWESOME! After the initial “pant-cacking” moment of getting to the main road, on the dirt track, with sheer drops, I felt exhilarated. The mountain roads are all curves, like a good woman! They are great quality and it has helped me immensely with my confidence. The Spanish drivers aren’t as cautious as I am but I am learning every day. I constantly want to stop and take pictures, the views are just stunning. The pictures I take never do it justice and the feeling of being in that scenery, gliding around the corners is just breath-taking. As we are staying at the top of the mountain, it takes us an hour to get to the bottom each time we want to go out… so, it has really helped me gain confidence in cornering. “I turned a corner to find a biker down in the middle of the road. So, the first ride out with a group… what an experience… one I will never forget. It was also my first experience of a BIKER DOWN. 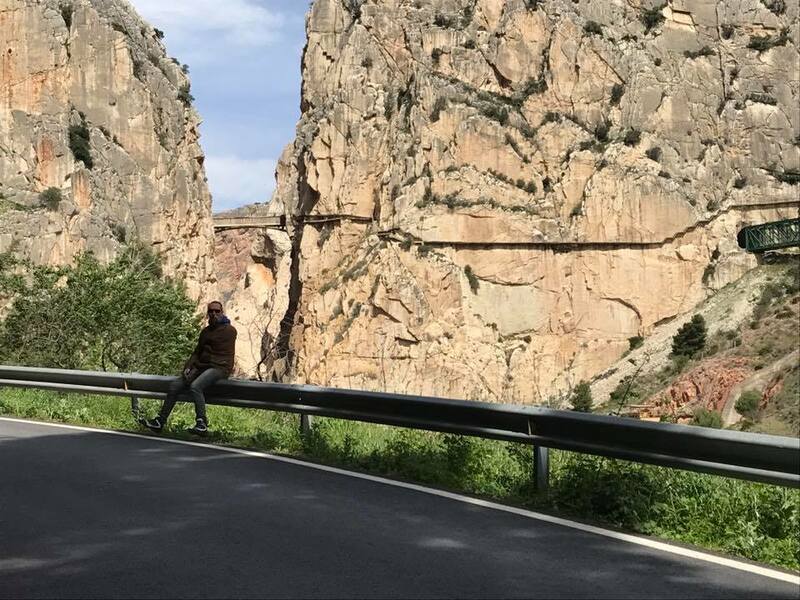 There were about 10 of us mooching up the Zafarraya Pass in the Axarquia region. I cannot tell you how stunningly beautiful the scenery is. Words or pictures failed me. You just have to do it yourself and see it. The views just go on forever. It was nerve-racking with the sheer drops and I slowed right down as I was scared of riding off the edge at times. The Harley has been lowered and the suspension isn’t very forgiving on the very bumpy roads, but it handled like a dream. Down the mountain we came after lunch at a beautiful café, round the windy roads, scary drops, awesome views and amazing company. I turned a corner to find a biker down in the middle of the road, face down, noisy breathing, blood pouring down the asphalt. They had gone slightly ahead of me as they are more experienced. I was asked if I knew first aid. I had a little experience due to being on previous first aid courses but never had to use it before. He was unconscious and his breathing was very laboured. He sounded like he was choking on his tongue which is when autopilot kicked in and I managed to ease his breathing. While I heled him an ambulance was called but due to being high up in the mountains we knew it was going to be a while before they arrived. I kept him as comfortable as possible and tried to keep calm, and in a still position in case of spinal damage. This poor biker had blood pouring out of his nose and mouth. It was quite a terrifying moment. What a baptism into the biker ride-outs! Getting back on the bike wasn’t easy after that experience. I crept back to the villa. I have to say, I had a good cry and hug with my partner. It does resonate with me now and again but I am so pleased that I knew basic first aid. I can’t emphasise enough that ALL bikers should have basic first aid knowledge and that a basic kit should be with one of the riders. Since then we have been out a couple of times. Most recently we went to see the Flamingos and to Torre Del Mar beach. We try to visit as many places as possible as the stunning scenery each day is so different. Riding the bike makes me feel more connected to the road and free to experience so much more than I have ever experienced to date. In a car you don’t take any notice of your surroundings; the smells, the views, the scenery but on a bike you are more connected to the ground and appreciate it more… I’m not sure if this makes sense but bikers will comprehend those words. The biker community is huge and so giving. I trade at bike rallies and ALL profits go to charity, they all give their time and they just care. They can look scary to some people but please don’t judge. The biker before you may have helped raise £10k at a rally that may have provided a disabled child an electric wheelchair or something equally as unselfish. won’t handle a 900cc bike”. They didn’t do anything to try and encourage me to buy it, or suggest any lowering options. I have yet to find another female rider to share my riding experiences with apart from social media but hope that when the summer comes I will be able to go to bike nights and meet other female riders! I don’t call myself a biker chick, just a chick that has her own bike and loves riding. Do it. Don’t let anyone stop you or put you off. Go for your dream and you will feel like me. You will only wish you had started years ago. I can’t describe how much fun and excitement you are missing! Rachel Baker is a body piercer from the U.K. She spends the Summer months trading at Bike Rallies around Britain and raising funds for charitable causes. She runs a 5 star business, All Body Jewels and has temporarily relocated to Spain with her Harley Iron 883 to ride every day while the sun shines. You can connect with her at the links below.